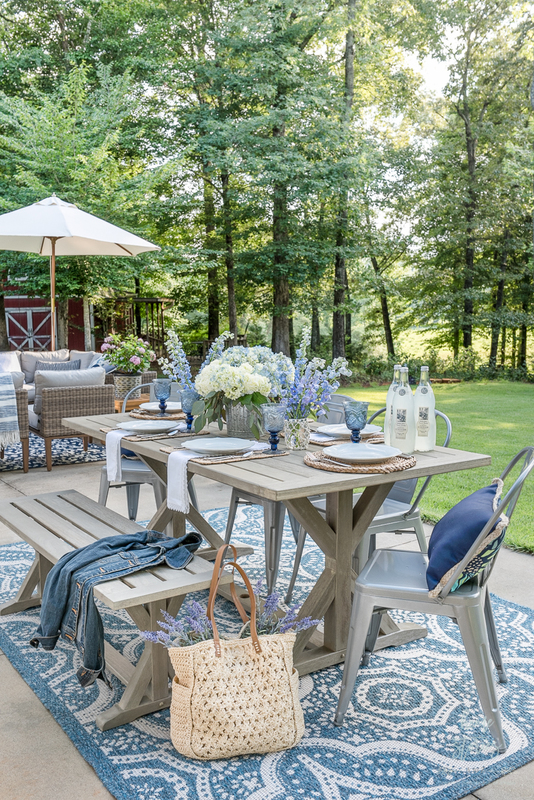 Outdoor furniture and accessories can be expensive. Here are my tips for getting a high-end look for less! 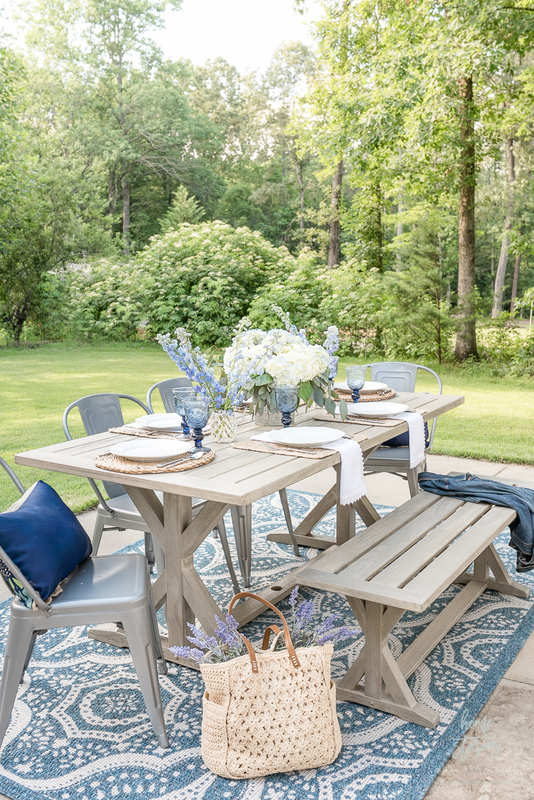 Read more to find out all of the sources for my patio in my post, Affordable Patio Furniture and Outdoor Decorating Tips. If you’ve been following me for awhile, then you know that I currently work as a Better Homes & Gardens at Walmart influencer. A blog friend of mine recently remarked that he’s always blown away with the things I do with products from Walmart. Truth be told, Walmart has some incredibly cute items that easily fit with my style. This blog post, however, is NOT a sponsored post. I’m not getting paid to write this post and wasn’t asked to write it. I just want to share all of these beautiful patio pictures with you! More importantly, I want to share my budget decorating tips and show how decorating on a tight(er) budget–cause let’s face it, budget decorating is a relative term–is both possible and obtainable! I will affiliate link all of the sources I used on the patio throughout the post and again at the bottom. 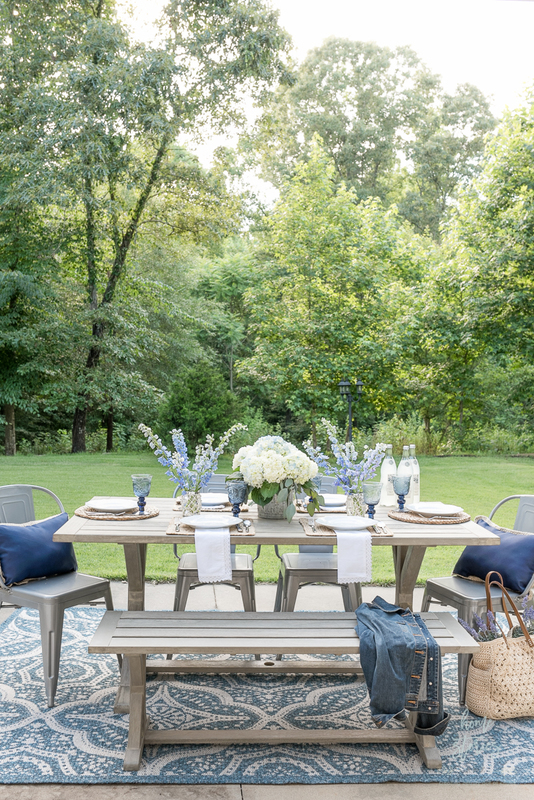 Outdoor Decorating Tip 1: No matter how large or small your space, think in terms of outdoor rooms. Our patio is a large rectangle, and I broke the space up into a dining area and seating area. We also have a portable fire pit that we use between the two spaces when we want to roast s’mores. (My hope is to create a a beautiful gravel fire pit area on our property soon, but that’s going to require some money and excavating and will have to wait for now.) Even if all you currently have is a small balcony, think about how you want to utilize the space and purchase furniture that will allow you to make the most of it! 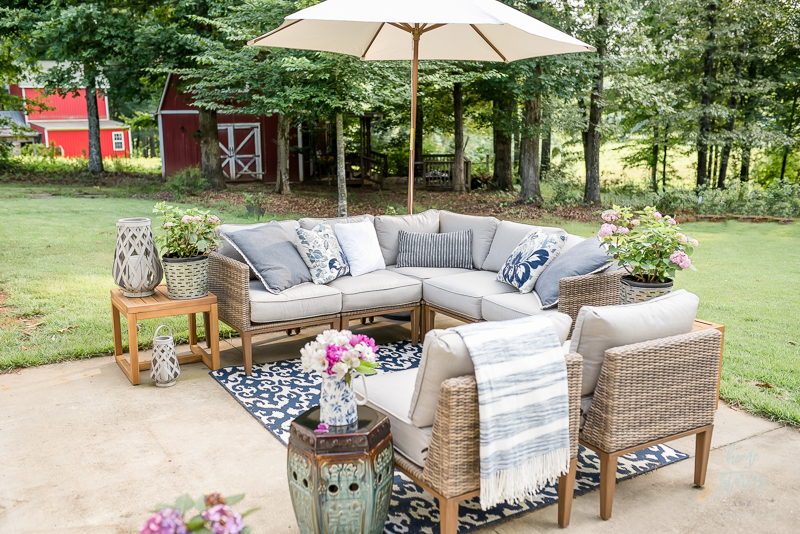 All of my outdoor furniture and both rugs are from Better Homes & Gardens at Walmart. See all sources linked at the bottom of the post. 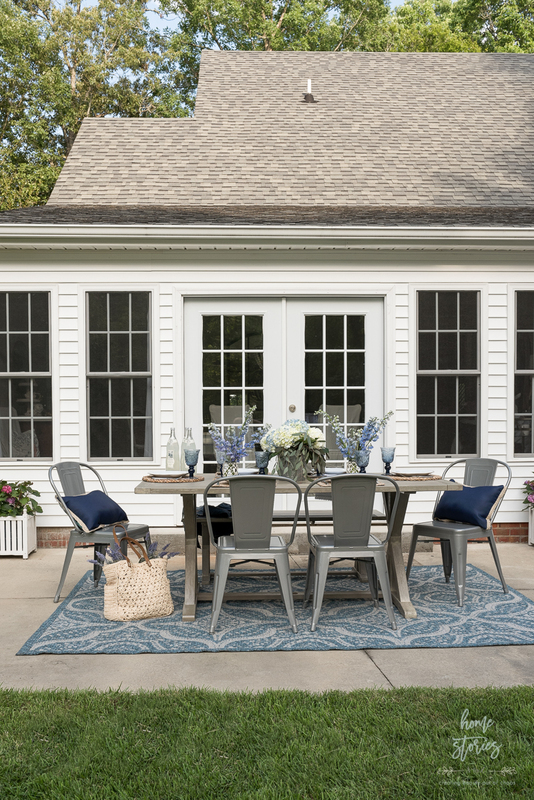 Outdoor Decorating Tip 2: Use outdoor rugs to ground each space. 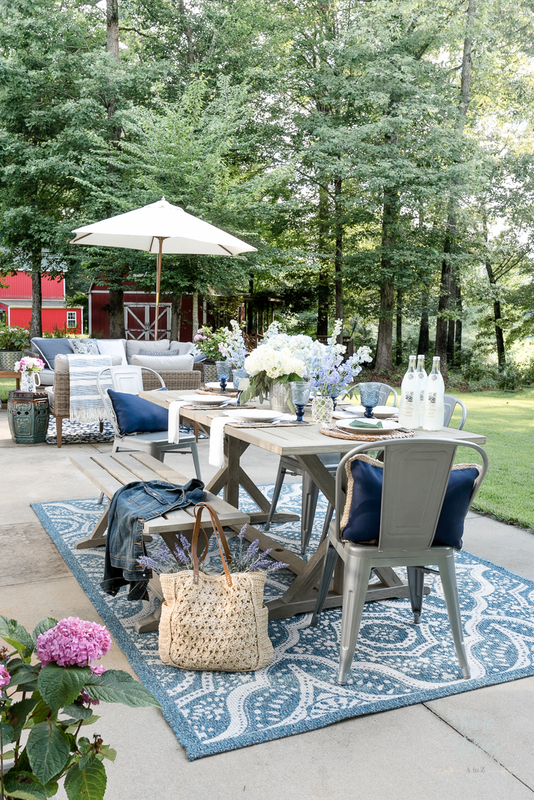 Outdoor rugs are one of my favorite outdoor decor inventions ever! They clean up easily, look beautiful, and complete a space. I just blow mine off with a leaf blower once a week and they look good as new. 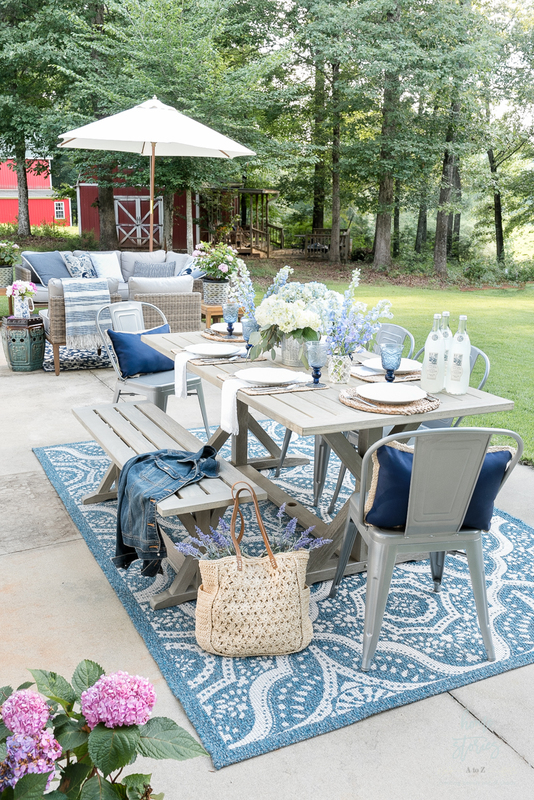 Our patio receives a lot of hot South Carolina sun so after rain showers our rugs tend to dry out quickly. 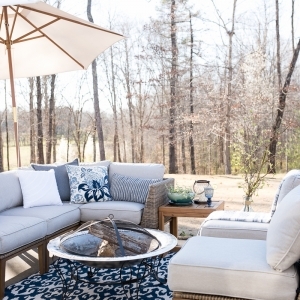 If your patio is shaded but not covered, then an outdoor rug might not be the best option for you. 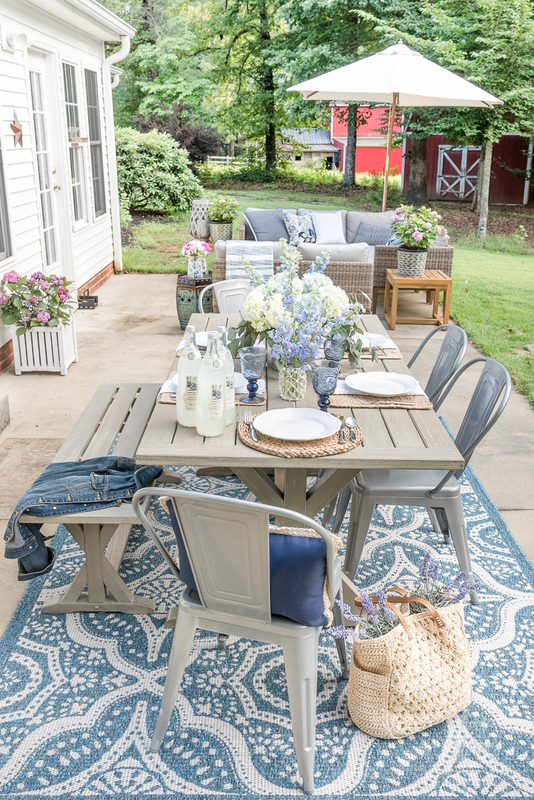 Instead consider painting your patio to create a cement tile or rug look. 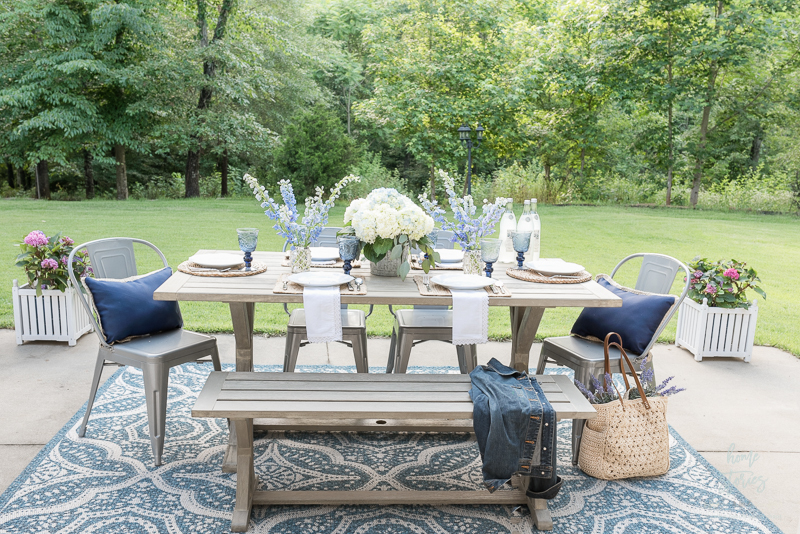 I used the BHG Damask Outdoor Rug in our seating area and the BHG Camrose Quatrefoil Rug in the dining area. 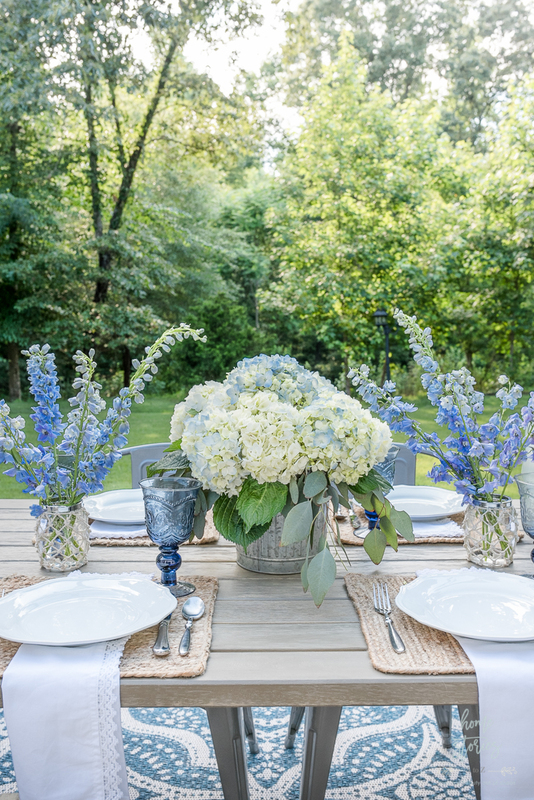 Outdoor Decorating Tip 3: Think outside the box for your floral containers. 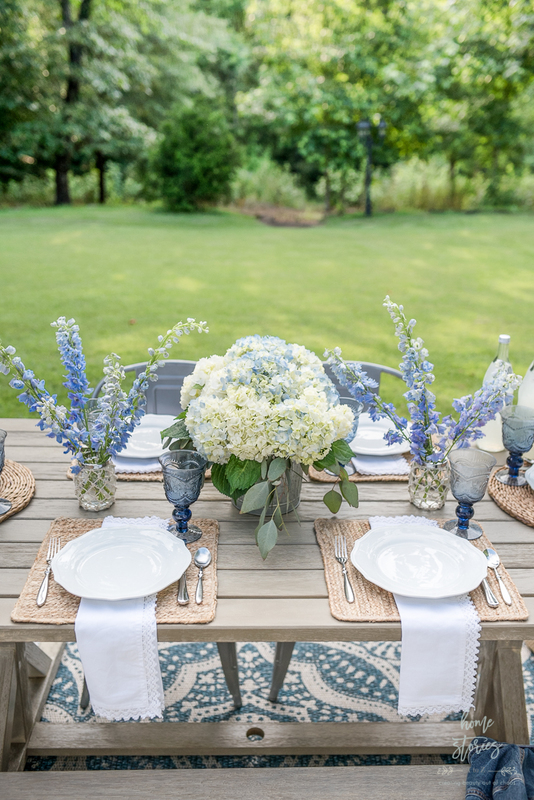 Fresh flowers always make a table, and I love adding them indoors and out! Trader Joe’s is my go-to for the best selection at the cheapest prices. 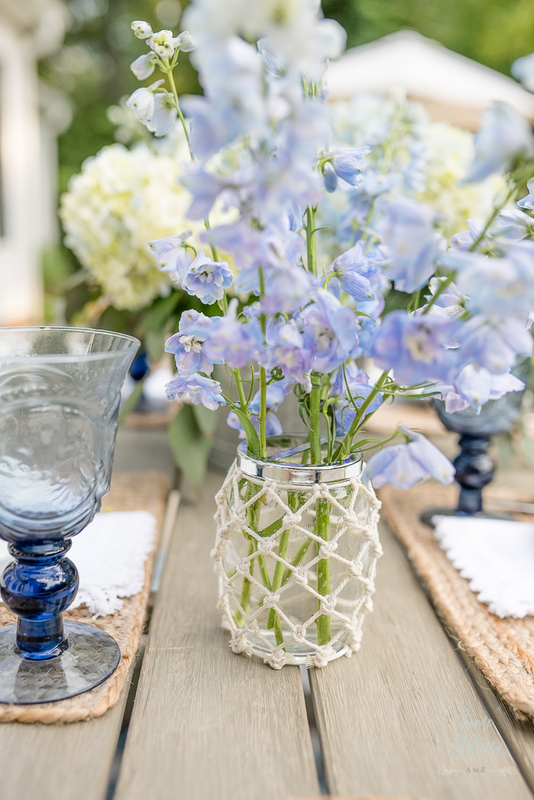 When arranging flowers, think outside the box for your vases. On my table, I used an ice bucket and two toothbrush holders as vases! The Better Homes & Gardens Nautical Tooth Brush Holders make fantastic vases! 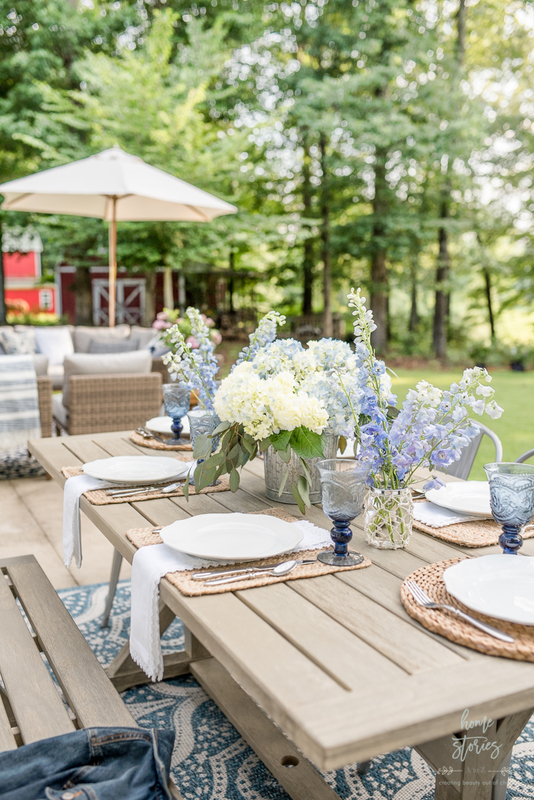 I needed a rather large vase for my centerpiece and the Better Homes & Gardens Ice Bucket and Scoop complimented the metal chairs and worked perfectly for my arrangement. 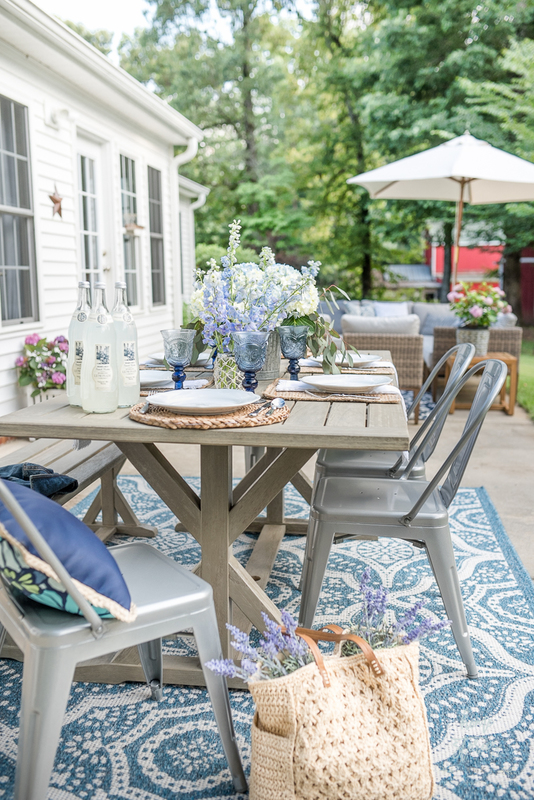 Outdoor Decorating Tip 4: To elevate the look for an evening, use indoor items outside. Melamine and plastic dishes have come a long way, but I still like to use real dishes for a more formal feel. I like to create a look of casual elegance by mixing casual elements with lots of texture. I often use indoor toss pillows outside just for the evening and bring them insides when the day is done. 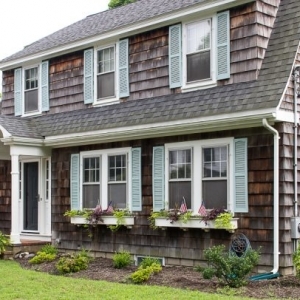 Outdoor Decorating Tip 5: Use a simple color scheme to create a cohesive look. I’ve repeated this tip several times on the blog before, but it’s one worth repeating! If you’re looking for a way to quickly elevate your look, choose only two colors to decorate with. Using multiple colors for a bold, eclectic look is lovely but requires more skill to pull off. Keeping the color palette simple allows you to decorate with confidence. Add textures and layers to keep the space from looking flat. 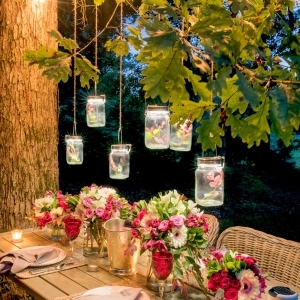 Outdoor Decorating Tip 6: Use drink bottles as decor. 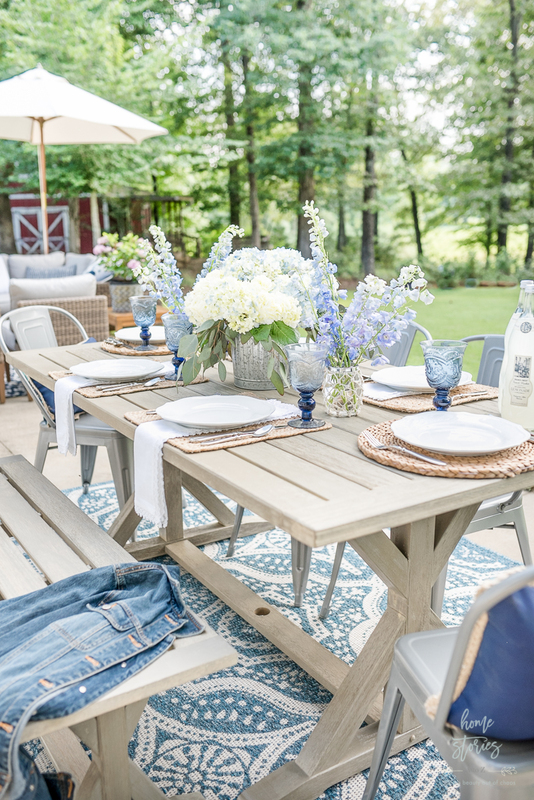 This tip might sound silly but think about your favorite outdoor restaurants. Oftentimes they come to the table with a glass carafe of ice water with maybe a side of citrus and leave it on the table for you. It’s welcoming, it allows you to control your water/lemon ratio, and it looks lovely on the table! 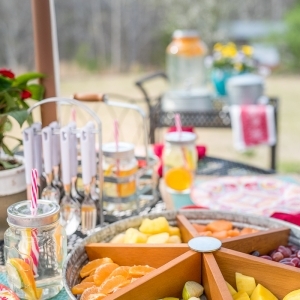 You can easily replicate this for your guests with pretty bottles of lemonade, or glass carafes filled with water. The lemonades on my table happen to be from Trader Joe’s, but I often find fantastic deals on pretty drink bottles at Big Lots. I hope you enjoyed these tips! And if not, I hope you enjoyed the pretty pictures! Shop the items I used in this post using the links below. Straw Bag: I can’t remember! I think either Walmart or Christmas Tree Shop a few years ago. 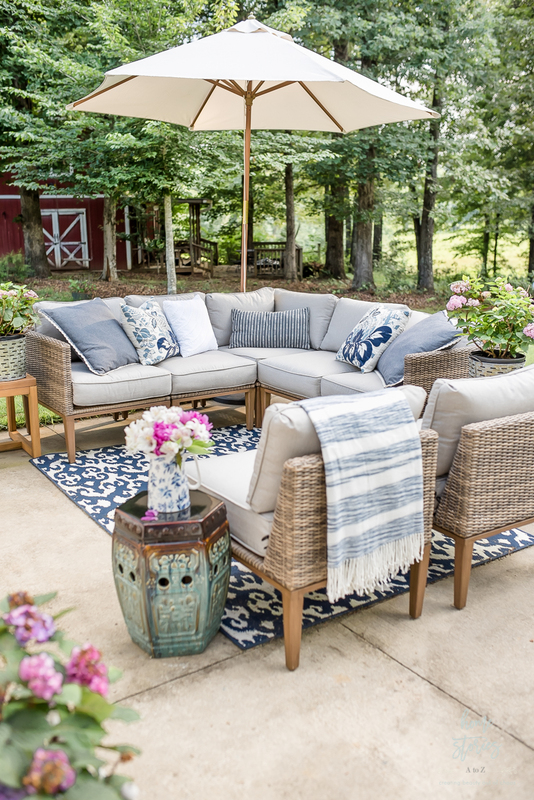 Sectional- Better Homes & Gardens Davenport 7-Piece Woven Outdoor Sectional Set **This is often sold out online but may still be in-store. It includes the sectional, pillows, and side tables. Toss pillows-All old ones I’ve had for a few years with no current links. It looks fabulous. What a great place to entertain and enjoy the beautiful outdoors.